Here at International Bath and Tile, we have had a spectacular relationship with TOTO from the beginning. Drawing upon a century of experience, TOTO has evolved into a prestigious global plumbing company. We are honored to be one of the first showrooms ever invited to travel to Japan and visit their factory. Since we have had a relationship with TOTO from day one, it is remarkable to see them grow into such a beautiful brand step-by-step. To this day, TOTO has distributed their products in such smart ways and we absolutely love when a new TOTO product is created. That being said, we are excited to introduce you to an innovative washlet that needs to be on your radar: Neorest. This signature product is a toilet bidet combination with features that exceed innovative expectations. Here are four reasons why Neorest Washlet will transform your bathroom experience forever. Neorest will leave you feeling clean from both a medical and hygienic perspective. There are multiple cleanses all the way from the rear to the front. No hands are needed! These features make the Neorest ideal for feminine and elderly hygiene. It is no wonder that urologists, caretakers, and doctors love this product. We won’t forget to mention the built-in deodorizer and self-cleaner! After you’ve been washed and dried, the deodorizer is sprayed for a fresh scent. Next, eWater+ rinses and cleans the bowl. With Neorest, there is no need to ever hassle with cleaning the toilet yourself. 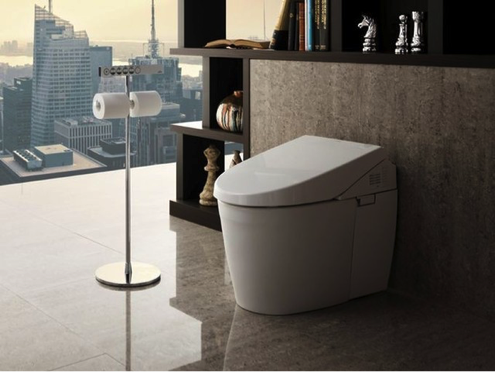 TOTO has truly designed a luxurious and relaxing toilet bidet combination with Neorest. It comes with heated seats, fully adjustable spray, precise temperature, and auto lid for opening and closing. You will certainly appreciate the precise temperature and intimate cleansing. Depending on the product type, the Neorest ranges from $600 to $6,000. You can choose the “Rolls Royce” toilet with the bells and whistles, all the way to the basic Neorest with a regular seat. We love how TOTO makes it possible to purchase a high-quality toilet in your price range. From an installation point of view, Neorest is one of the easiest products to install. It comes with an electrical outlet that is easy to plug in. Here at International Bath and Tile, we have installers that are familiar with products such as the Neorest. We are happy to give you names of plumbers that have installed the Neorest before, so there are no excuses that it’s too difficult to install. We invite everyone to please visit International Bath and Tile’s showroom and experience the Neorest first-hand. Our experts can help you with all of your questions. If you are remodeling your home, we would love to help with every step of the process. To see our work, visit our Pinterest and Houzz pages. We look forward to seeing you in the showroom!